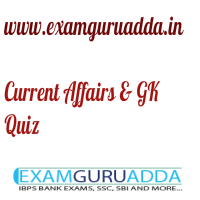 Dear Readers Examguruadda.in presents Current Affairs quiz of 1st-2nd January 2017 that cover important current affair events. Current Affairs quiz for IBPS PO,clerk, RRB-Po,Clerk, SBI, NIACL,Railways and SSC Exams. 1. Which Hindi writer have been chosen for Bharatiya Jnanpith Navlekhan Award for the year 2016. for her short story ‘Hawa Mein Phadphadati Chitthi‘ ? 3. Who took charge as the 22nd Chief of the Air Staff (CoAS) of the Indian Air Force (IAF). by succeeding Arup Raha? 4. Who took charge as the new 27th Chief of Army Staff (CoAS) of India. by succeeding General Dalbir Singh Suhag? 5. ______ and ______ signed the 3rd protocol for amending Double Taxation Aviodence Agreement (DTAA). 6. The IFFHS Award of The World’s Best Playmaker was awarded to which footballer? 7. Recently who has been officially appointed as the new Prime Minister of Romania? 8.India’s first transgender school ______ has started at Thrikkakara in Kerala’s Ernakulam district. 9. The World famous 11-day gala festival Bargarh Dhanua Jatra began in which western state? 10. Which Hindi writer have been chosen for Bharatiya Jnanpith Navlekhan Award for the year 2016. for his poem ‘Akash Mein Deh‘. ?